Limited load/save support (it'll "forget" the current work in progress). It probably won't behave nicely when there's no trains available, so don't start the game in too early a year. It cheats a bit by extending its station coverage with bus stations; this requires "build on town roads" to be enabled. No train replacement except autorenew, but it will switch to new rail types when it starts a new network. Requires 0.7.2 or newer; 1.0 works fine. It'll play nice with multiple instances of itself because they randomize their starting spots. It's also independent of map size. I've implemented the main processing loop as a "to do list" of tasks. Each task is represented by an object, holding enough state so tasks can be broken off (usually due to running out of money, but it could also be a VEHICLE_IN_THE_WAY, etc.) and resumed. For example, building a crossing is a task (with several subtasks) which then pushes four new tasks onto the queue to expand its four exits. - fixed "Inconsistent compare function"
Holy crap, has it been over five years? Last edited by Michiel on Fri Aug 25, 2017 10:07 pm, edited 38 times in total. Don't mind if I do . That network screenshot looked to well that I could pass by without giving it a quick shot. The first result is shown in the first attachment which featured my current test newgrfs. It kinda failed... Building a number of those hubs but nothing else. 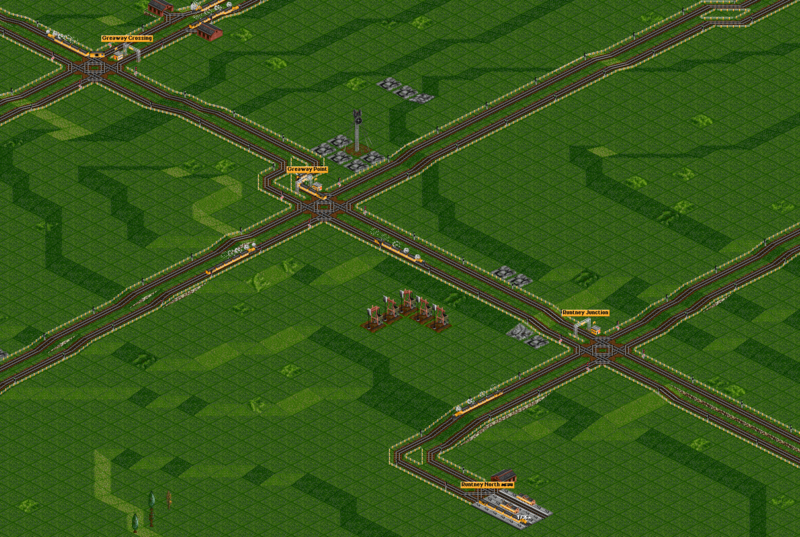 Setting was starting year 2000, 150k GBP initial loan, on a hilly rough 512^2 temperate map with normal town density. This loop-behaviour seems to be a general problem where it actually blocks itself; the AI has a problem with routes which are routed along a shore where it builds the wrong track of the two first so that the other then loops around one hub. Are you btw going to improve these crossings by using bridges / tunnels so that the transition of 1 train doesn't block the access for any other train on a crossing? Not sure - I'll probably try to manage (reduce) the number of trains instead. Those overpass junctions take up a lot of space, and they don't look very nice. Bananas: good point, I'll look into that. Looks like a good concept, keep it up! Looks like it's working as intended, though... what happens, does it go bankrupt? The red output is, unfortunately, unavoidable if you use exceptions in your code. The first screenshot shows it's waiting for money before continuing, and the second is an expected failure (it can't extend a crossing because there is no town in the area it's looking in). It should just continue - though if it runs out of starting funds before it gets a decent line going, it won't get very far. Well I've played like 5-6 games and the AI went bankrupt all the times. I even left it alone with no one to compete and it bankrupted in 3-4 years top. The problem I see is that it chooses small towns and the trains produce little income and can't keep with the taxes, since the interest is 10k/year. Another problem is that it takes all the loan at once and steadily loses money. Another thing is the crossings it makes everywhere which cost ~15k each, but still doesn't connect them. There should be some priorities in choosing towns, which will make it operate much more efficiently. I like it though, keep working! Edit: It doesn't build enough trains ( money issues ) but later, when it has, it doesn't build additional trains to service the route. Last edited by Wold on Wed Jul 08, 2009 6:17 pm, edited 1 time in total. Update: now evaluates seed crossing sites and starts out building cheap (shorter distances, ignore small towns, cheap locomotives, no extra crossings), so it usually manages to bootstrap itself on a 100k loan in desert maps. 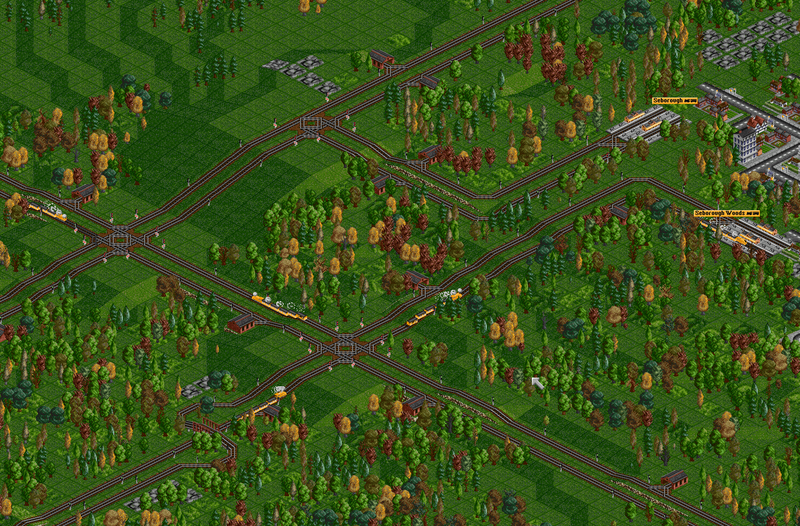 It also restricts itself to one station per town, which cleans up the map quite a bit. LOL, what the... it built that? In that case, the pathfinder needs a good spanking Or did you mean that was the handiwork of the old AI? I'm pretty sure the AI pathfinder I use won't build 90 degree turns. I think I know what you're referring to, where it builds bridges to "hop over" the other track. I'm currently using a pathfinder I borrowed from OtviTrain; I should switch to the library one. It may have some improvements for this case. Hmm.. Question for other AI writers: how hard is it to support NewGRF trainsets? I've never used a NewGRF anything. They seem to be quite popular, so if it's not too hard, I'll look into it; otherwise I'll focus on the network building aspects first. The library pathfinder has the same problem. It's easy really, just use AIEngineList and the AIEngine::* functions to select an engine instead of hard-coding one. Really cool AI Michiel. Its a nice, elegant way to create a network. Hmm.. Question for other AI writers: how hard is it to support NewGRF trainsets? I dont do train sets yet but I have tried to work with some RV sets. I think you just need to try some popular sets and balance your selection criteria accordingly. NewGRF authors don't stick to a set of common rules so sets can be very different, especially the prices and running costs. One issue I found with eGRVTS (large RV set) is that vehicle statistics were balanced differently depending on the date of their design, especially for very early vehicles (pre-1950). I use the current date as a balancing factor in my selection criteria to address this. I dont think there is any way to guarantee that your AI will work perfectly with all NewGRF sets though, given how vastly different they can be. Oh, I'm doing that already, either picking the fastest or the cheapest (after checking it's not a wagon - the first attempt at cheap was trying to have copper ore hoppers pull its trains ). I'll see if I can install one of them new fangled train set thingies and see what happens. FHS, I assume you were trying it with "the 2cc set"? One time the 2cc set and another time the outdated swiss set taster, i didnt seem to work with either. Something else - because of all the checks the AI does the game runs hell of a slow. You should consider a limit of some sort ( either from the AI itself, or user-defined ).